Institute researchers have uncovered new insights into how the normal controls on cell growth are lost in cancer cells, leading to rapid tumour expansion. The findings could help researchers predict how cancer cells respond to chemotherapy and improve our understanding of how cancer evolves. 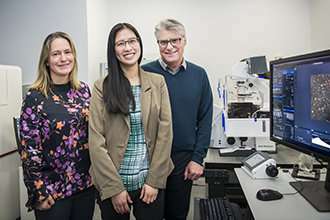 Published in the journal Cell Cycle, the research was led by Dr. Kim Pham and Professor Phil Hodgkin and performed in collaboration with Dr. Kelly Rogers and Dr. Lachlan Whitehead at the Institute’s Centre for Dynamic Imaging. Cell replication is a normal process that generates additional cells, enabling the body to grow, repair tissues and generate germ-fighting immune cells. In order to replicate, a cell first copies its genetic material, DNA, and then physically splits in half to form two new ‘daughter’ cells. This process, called the cell cycle, is normally tightly controlled to prevent excessive growth, which can lead to cancer. In this study, researchers uncovered precisely how the cell cycle is derailed in cancer cells. “We found that compared with healthy immune cells, cancer cells had dramatic changes in their cell cycle,” Dr. Pham said. Since 1973, scientists have assumed that the second phase of the cell cycle, when DNA is copied and the cell splits in half, takes a fixed amount of time, while the first phase takes a variable amount of time. Several years ago, the team challenged this theory in healthy immune cells, showing that both phases of the cell cycle contribute to changes in replication time. Now, they have upended the theory in cancer cells too. “The old theory predicts that all variation in replication time comes from the first phase of the cell cycle,” Dr. Pham said. The discovery was made in collaboration with the Centre for Dynamic Imaging, a laboratory within the Institute that offers researchers access to advanced imaging technologies. “For this study, we tagged cancer cells with a fluorescent sensor that changes colour as cells progress through the cell cycle,” Dr. Pham said. “We then performed single cell imaging to track each phase of the cell cycle as they underwent replication,” she said. The researchers then worked with bioimage analyst Dr. Whitehead to analyse and interpret their data and develop a new mathematical model for predicting when cells replicate. “This study demonstrates the power of imaging to directly reveal cellular behaviours, and in some cases challenge assumptions that were made before it was possible to obtain such clear evidence,” Dr. Whitehead said. Professor Hodgkin said the research could impact on our understanding of cancer. The team’s finding that the first phase of the cell cycle is minimised in cancer cells suggests a vulnerability that could be targeted by cancer treatments. “Cancers have often lost the safety checks that prevent replication in the presence of errors such as DNA damage,” Professor Hodgkin said. “Our work suggests the lack of these safety checks leads to the first phase of the cell cycle becoming much shorter in cancer cells.